In India, since the most ancient times, woman has been the object of special devotion. Indusvalley figurines, fertility deities, and the goddess figures standing guard at the entrances to Gupta holy places are all illustrative of the fact that the female image – right up to the medieval period – was an eternal theme for Buddhist or Brahmanic sculptors. The traditional representation of female sensuality – as seen here – was maintained down the centuries. Only the bust of this female tree spirit, leaning against a fragment of foliage, has survived intact. 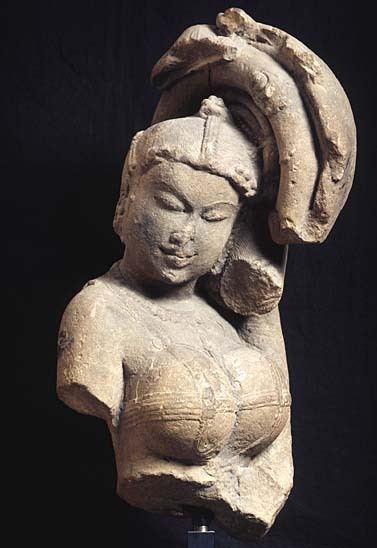 The figure is endowed with an ample bosom, and both the position of her head – slightly tilted to the right – and the twist of the bust are perhaps indicative of the original tribangha or “triple flexion posture”, characteristic of Indian sculpture. The earrings and long pearl necklace are tokens of the abiding passion of Indian women for jewels and finery. This appealing sculpture, with its naturalistically treated body, curvaceous forms, and purity and grace was destined to join the countless minor goddess figures – devata, who charmed the gods by their presence, and female tree spirits, or shalabhanjika, symbolizing fertility”who embellished the walls of Indian shrines. The production of Northern Indian art in the medieval period (9th-14th centuries) was rich and varied. An extraordinarily forceful and exquisite Brahmanic art blossomed in the great northern provinces – for instance in Rajasthan, or in Western Madhya Pradesh at Khajuraho-which witnessed the emergence of distinct architectural and sculptural styles. In most of these regions, the often-grandiose architecture was always lavishly decorated.